Mineral County, Nevada was created in 1911 and is located in West-Central Nevada with the rugged Wassuk Range serving as a boundary dividing Mineral County from Mono County, California and Lyon County, Nevada. The Wassuk Range averages 9,000 feet elevation with Mt. Grant extending up to 11,245 feet. Mineral County is generally mountainous, with canyons and large arid plateaus rising upward from the Walker Lake Basin. Mineral County's primary industry is the U. S. Ammunition Depot which is the worlds largest facility of its kind. Tourism plays an important part in the county's economy as the outdoor enthusiast can find adventure in hiking, horseback riding, motorcycling, fishing, hunting, swimming, water skiing, rock, bottle and artifact hunting, and ghost town exploring. 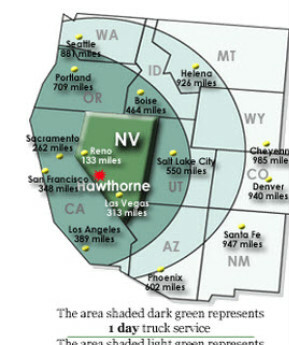 Hawthorne is located in west central Nevada. 132 miles southeast of Reno/Sparks and 311 miles northwest of Las Vegas at the intersection of U.S. Highway 95 and State Highway 359. At an elevation of 4,255 feet, Hawthorne is situated in the high desert, approximately five miles southeast of Walker Lake. Hawthorne's central location and easy accessibility provides excellent transportation advantages to business and industry.